Recently, I’ve written about why presenting 6 options is the best thing to do for you and for your customers. I’ve also shared the rules and guidelines of building winning options. But you’re not ready to go hand over your option sheet to a customer just yet. There’s something very important missing. What kinds of thoughts would be going through your head? I’m guessing pretty suspicious ones. Why does he want my phone? What’s this guy up to? If I hand it to him, he might just take off running with it. What kind of wack-job asks a complete stranger for his cell phone on a street corner? It sounds like an odd request when you don’t understand why he’s asking. It comes off as weird and shady. It’s just like when you’re called out for a simple repair. If you just hand your customer a sheet with 6 options on it with the most premium one at the top, what will most people think your reason is for making those options? They’re going to think you’re doing it for selfish reasons. To get them to spend more… to upsell them. The truth is that you’re trying to provide them with Pure Motive Service. You want them to have the ability to choose the perfect solution for their family… but if you don’t tell them that, they won’t understand and you risk coming off as a shady upseller. Now what do you think of him? It seems like a normal, reasonable request, and you’ll likely let the guy use your phone. What causes that swing in perception from “shady” to “reasonable?” One simple, powerful word… BECAUSE. By using the word because, he’s explaining the reason for his request. And when you understand his reason, you’re much more likely to listen and comply with what he wants. The results of the study showed that requests without a “because” were granted only 60% of the time, but requests that included a good because were granted 94% of the time. That’s around a 55% increase. If we look at that in terms of presenting your options to a customer and making sales, it follows that just by using the word “because” and explaining the reason for your options, you stand to see a significant upswing in your conversions. But how do you come up with a good because when explaining your option sheet? In our Total Immersion system, we have what we call our benchmarks – which is a step-by-step guide to running an on-code call. If you follow the benchmarks, you’ll wind up knowing everything you’ll need to know about not only your customer’s system – but also about them, their family, and their lifestyle. Once you have that information, you can easily use it to create a great because that will put your customer at ease and demonstrate to them that you’re there to do what’s best for them. …and then tell them your reason based on what you know about them. For example, if your customer Jim travels all the time for work, system breakdowns become a major hassle for him while he’s gone. There are tons of phone calls and texts with his wife when something breaks, and he has to worry about his family not having water or heat or cooling or whatever the problem is. It’s incredibly stressful. The reason I created these options for you, Jim is because I know you work hard and travel a lot. And I understand that the last thing you need when you’re busy and out of town is to be worried about the safety or comfort of your family because something broke down again. So I made up a variety of options ranging from the most permanent long-term solution so you’ll never have to worry about your family while you’re gone – down to more economical solutions. One simple word, because, can make all the difference in the world for your customer – and for your bottom line. 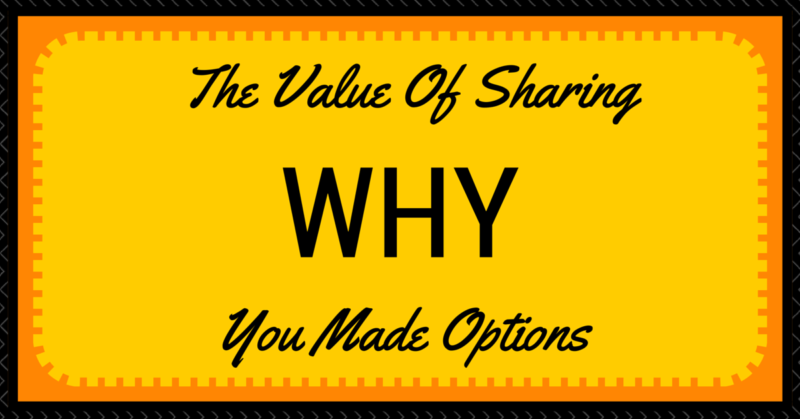 There are a lot of moving parts to creating winning options and presenting them effectively. If you’d like to get more information, more advanced tools, and even hands-on training to master option creation, I have two excellent resources for you. The first one is a digital tool we’ve created to virtually guarantee your options are on code every single time. It’s called The Best Ever Flat Rate Guide and you can get all the details about it here. The other resource you should take a hard look at is out Total Immersion LIVE Training Program. 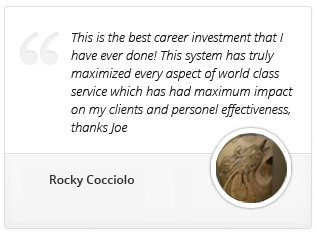 This program will teach you our entire system from diagnosing the whole system, to using our benchmarks, magic moments, option building – and everything you need to know to provide world class service while boosting your bottom line. In my next article, you’ll learn how to use your customer’s objections as a vehicle to move the call forward toward a positive outcome. Have you ever encountered resistance from a customer when presenting options? Does using a “because help? Let’s talk about it in the comments below.